Shutter priority, ISO 400, Aperture 4.5, Speed 1/4. One of my friends has just celebrated the big four oh and did so in style by arranging a 1920s Charleston Workshop with an instructor. Everyone entered into the spirit and after a number of frantic phone calls, visits to charity shops and begging, borrowing and stealing we were transformed. I was asked to be the photographer which can be a little nerve-wracking but after my recent course, I was up for capturing some motion blur as well the atmosphere of the party. Another baking triumph for Ali and Nicola! Small things make me feel happy – like pink canvas shoes reminding me of ice-cream and Cornwall. I love the graphics on the shoe box, White Stuff always get it so right! In South Africa we called trainers ‘tackies’. Why? Is it because of the trreeck-treeck sound they make as you walk? I decided it was high time Boden was at the receiving end of direct mail and sent them a proposal as a mood board. It was well received and made it to the head of marketing although there it was turned down… ‘whilst it is a really great concept, it is not something that we will be able to pursue further at this stage.’ Next stop – Joules! It’s our turn to make you a cheeky little offer. In the late 1990s a number of us studied together in London (mostly to become lawyers – though not the stuffy & boring sort). In those days we could party long and hard. Now we’re all a little bit older. We still party (but not for quite as long or quite as hard). And there’s more of us. In 2006 we all produced a baby so all nine couples got together to admire each other’s offspring. And the annual Baby Party was born. 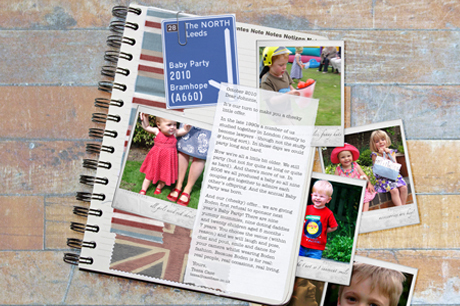 And our (cheeky) offer… we are giving Boden first refusal to sponsor next year’s Baby Party! There are nine yummy mummies, nine doting daddies and twenty children aged 5 months – 7 years. You choose the venue (within reason) and we will laugh and pose, chat and pout, smile and dance for your camera whilst wearing Boden fashion. Because Boden is for real: real people, real occasions, real living.